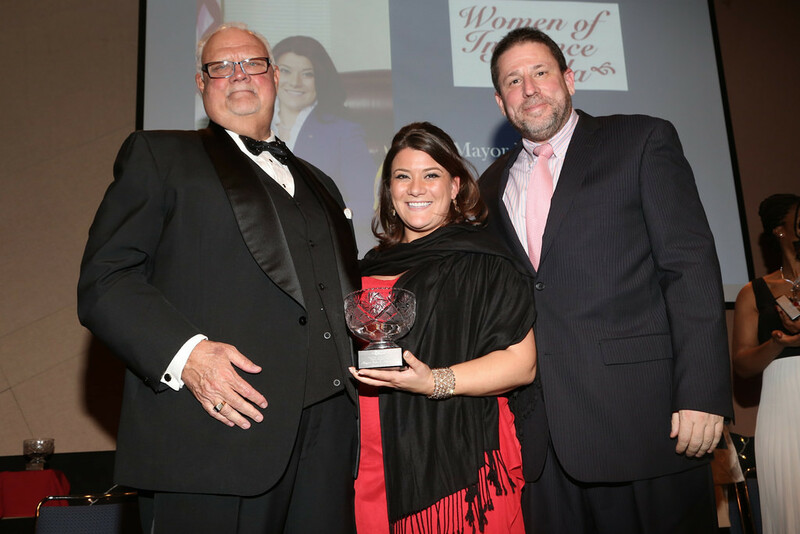 CCSU Honors Mayor Stewart with “Women of Influence” Award. NEW BRITAIN — It was a gala evening at Central Connecticut State University Saturday when seven community leaders were honored as Women of Influence in the Student Center’s Alumni Hall. The biennial event highlights the achievements of women who have made significant contributions in the lives of women, diligently promoted women’s rights, or have worked tirelessly to educate women. A 2009 CCSU graduate, Stewart is the youngest mayor in the city’s history. She has received national media attention from The New York Times and Newsmax, which named her to its “30 Most Influential Republicans Under 30” list in January, 2016. Beryl Piper, 1987 CCSU graduate and CCSU’s women’s basketball head coach, said she was “totally surprised” by the honor. “It was humbling for them to choose me and it’s nice to be here with Erin and (fellow honoree) Tamika Knight who also played basketball at Central,” she said. Piper said she played basketball at CCSU from 1982 to 1986. She went on to teach physical education at Smalley Academy, Slade Middle School, and New Britain High School. She also spent 19 seasons at NBHS as head coach, winning three state titles. “I live in Trumbull but I kind of look at New Britain as my second home. I spend so much of my life in here and I have a lot of really good friends here,” Piper said. A 1991 CCSU graduate, Zettergren is ConnectiCare’s senior vice president and chief sales and marketing officer. She has been with the company since 2010 and has more than 20 years of leadership experience in the healthcare industry. She also serves on Special Olympics Connecticut and several other community boards. Knight, a 2000 CCSU graduate and a fifth grade teacher at the Annie Fisher Science, Technology, Engineering and Mathematics Magnet School in Hartford. A Hartford native, Knight has dedicated the last 14 years to her students, school, and community. Known for empowering and challenging her students, she was selected in 2012 for a Milken Educator Award, one of the most prestigious teaching awards in the nation. State Sen. Theresa B. Gerratana, 1974 CCSU graduate, who is serving a third term representing the residents of the 6th Senatorial District (New Britain, Berlin, and Farmington). Gerratana is chair of the Public Health Committee and a member of several other influential committees. She spent 10 years as a member of the state House of Representatives and three years as the State Elections Enforcement Commissioner. A New Britain resident, she is credited with helping to pass legislation for children’s health care and reforms in managed care and mental health issues. Robin P. McHaelen, founder and executive director of True Colors Inc., has earned national recognition for her work in lesbian, gay, bisexual and transgender youth concerns, programs, and interventions. True Colors, a social justice organization, works to create a world where the needs of youth of all genders and orientations are recognized and valued. McHaelen is the recipient of numerous awards and the co-author of two books and several articles on LGBT youth concerns. Cindy White, professor of communication at CCSU for the past 24 years, teaches courses in media studies, in addition to the Women’s Gender and Sexuality Studies Honors Program. In 2014, she was the recipient of CCSU’s Excellence in Teaching Award. Her love of teaching extends to her community outreach work through workshops and training programs on media literacy, gender and communication, and communication skills. This story originally appeared in the New Britain Herald, here.